I'm taking archery lessons with my family right now, because I have always been fascinated with this skill. And all of my oboe-playing body-use instincts are now wrong. I need to plant my body much more firmly, and NOT use my carefully cultivated oboe relaxation. 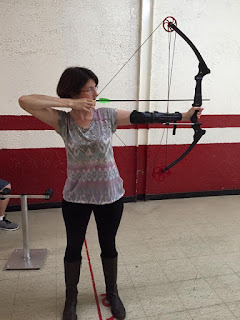 My tendency when I started was to use my whole body to lift and draw the bow, and in fact to manage my form I need to lock my lower body strongly and lift my arms from the shoulder and draw using my arm and shoulder and back muscles only. 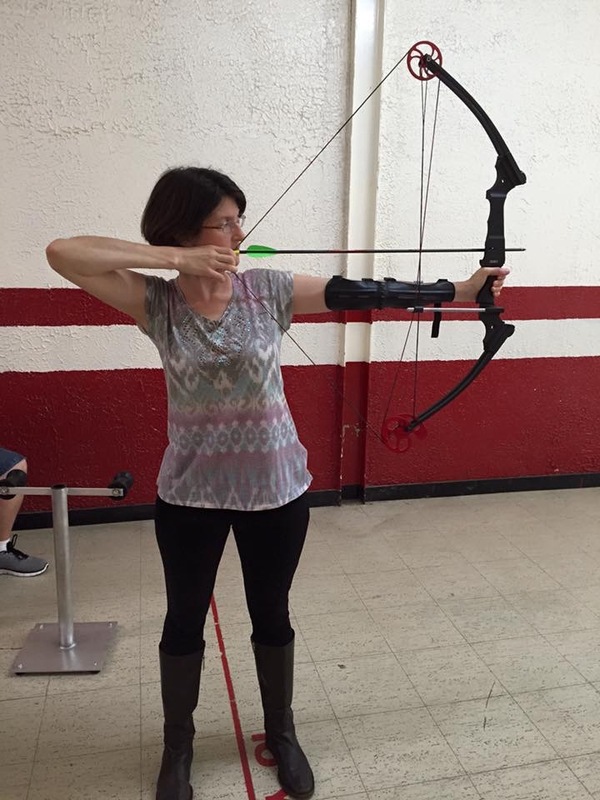 I need to NOT rotate and flex my hips and back to compensate for the weight of the bow. The muscle memory I use on the oboe is not helping me here. But my practice habits are. I've spent time in front of the mirror isolating the exact moment in the draw where my form goes bad. I've found a way to know what centered feels like as I stand square. I've practiced releasing without excess motion. I've gotten better, and it's fun. There are a million parallels between learning archery and teaching music. My favorite thing right now is the way our teacher really speaks to me and Steve very differently. Intentionally so, and in a way that is welcome and necessary. Steve has a different body from me, obviously, and approaches the bow more powerfully, but still has his own form issues to work on. completely tense and the sound is constricted. We have worked through many loosening-up-exercises, and a week or so ago we had a breakthrough, and he was proud. Is this something everyone has to get through? Does everyone learn about using Conversational Air before they get to be good? No, I admitted. Some people never have trouble with relaxed playing and I never have to talk about this. Some people I talk to about engaging their muscles MORE. It just depends on what their particular problem is. My student was surprisingly dismayed. I think he was looking for the oboe to be a set of concrete steps, like chapters in a textbook, or levels in a video game. But that's not it. Everyone comes in from a different place, with their own body and their own attitude and their own needs. It's my job to meet them where they are and bring them to the next place, and ideally to do so week after week until progress happens and they feel it themselves. When I began teaching I only knew how to say the things teachers had told me before, and it took some time before I realized just how creative you have to be to work with someone whose problems are different from yours. It's ceaselessly fascinating. And I'm fascinated and impressed, at the moment, with our archery instructor, who has made every one of us better in only a few sessions. What a treat to be a learner in someone else's experienced hands for a change! When I started cello lessons last year, I discovered I hold my breath when I play and squeeze my lips into an oboe embouchure. Yikes! Learning to relax relax relax and to use my arm now for rhythm and my back for support and my feet for stability and my air for life. I think the best thing we can do as teachers is become a student again. Well of course! How are you supposed to make music without your lips folded in and your breath under fierce constant pressure?! :-) I love it. When Does a Student Need a Stronger Reed?